June 10th is the day to honor your maker. If you’re not a vampire than you should honor the person who made you a True Blood addict. In my case that would be Alan Ball. I remember reading the synopsis for True Blood when it first aired and I thought: “Vampires? I don’t like vampires.” But than I saw the name of Alan Ball attached to the series and that was the only reason I checked it out. The rest is history. 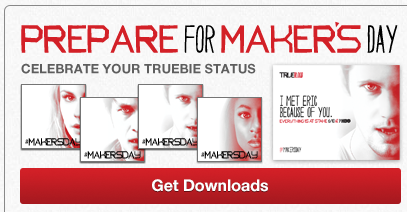 You can honor your maker on Facebook with the special True Blood app makersday.com. Several goodies can be downloaded there as well, such as profile themes and social avatars. 100,000 #makersday tweets will unlock script pages from a True Blood S5 episode. So tweet away Twitter peeps. Pam and Jessica thank their makers in these special Maker’s Day videos.